A fighter’s location at almost all times must be accounted for under the UFC’s new anti-doping program. 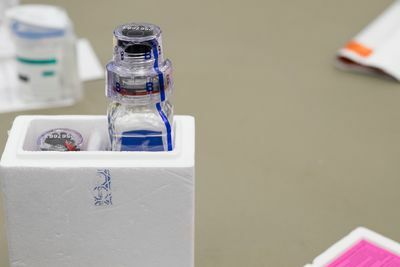 UFC athletes will need to inform USADA of their whereabouts three months in advance under the promotion’s new drug-testing program, UFC vice president of athlete health and performance Jeff Novitzky told Ariel Helwani on last Monday’s edition of The MMA Hour. If a fighter does not fill out or inaccurately fills out the online form multiple times, he or she could face sanctions. The new UFC exec said the process is user friendly and updating through the mobile app takes “20 to 30 seconds.” Novitzky added that USADA has plenty of experience using this system with its Olympic athletes. If a fighter does not fill out his or her information or punches in incorrect data with regards to his or her whereabouts in the system, that fighter could face sanctions, Novitzky said. A fighter will get three strikes over a rolling, 12-month period and on the third strike he or she could be disciplined. Novitzky said that if USADA informs him a fighter has received his or her first strike, Novitzky will be on the phone with that fighter immediately to see what happened. If a fighter gets a second strike? Novitzky said he would be on a plane to wherever that fighter is to “trail them” for one or two days to make sure they fill out their whereabouts information. “That’s gonna be, I think, a big part of my role coming up,” Novitzky said. The UFC’s anti-doping program under USADA began officially July 1, but it has not hit full steam yet. In October, a public website with drug-testing statistics will be launched. Novitzky said the transparency is what adds to this program being the “most comprehensive” in sports worldwide. “Everything is out there in the open,” he said. At one point not so long ago, the Blackzilians were a team in trouble. Guys were losing (from Alistair Overeem to Michael Johnson to Matt Mitrione). Guys were defecting (Melvin Guillard). People on the outside were gawking. But since solidifying its coaching staff, things have turned around in Boca Raton, Florida. Suddenly Rashad Evans, who had lost a dispiriting decision to Antonio Rogerio Nogueira in early 2013, is co-headlining UFC 170 against Daniel Cormier in a fight with title implications. Eddie Alvarez has avenged his loss to Michael Chandler in Bellator and is the champion again, and Michael Johnson — an underdog in his last two fights — is making Las Vegas oddsmakers pull their hair out. The CEO of Authentic Sports Management, Glenn Robinson, appeared on Monday’s MMA Hour and talked about the rough patch the Blackzilians team went through to once again find success. “You know, it’s kind of like a car accident,” Robinson said. “I was driving back from Disney with my wife and kids a few months ago, and I spent an extra three hours on the road because there was like a fender bender, and everyone had to stop and take a look. People enjoy seeing other people’s demise in my opinion. Among those coaches are Jorge Santiago, who hung up the gloves to take on a leadership role at Blackzilians and coach full time, and Kenny Monday, who has taken over the wresting reins. Then there’s Hooft, who became one of 2013’s best-kept secrets. His work has been paying dividends from Tyrone Spong on down the line. And Robinson told Ariel Helwani that the Blackzilians are adding to the stable with Tyrell Fortune, a 23-year old wrestler from Oregon. While Fortune is the future, there are many moving pieces with the Blackzilians’ present. One of which is what’s going on with free agent light heavyweight Anthony Johnson, who knocked out Mike Kyle on Saturday night in what could be a farewell fight in the WSOF. When asked if he’d been in contact with the UFC in regards to Johnson, Robinson said he didn’t find it “appropriate” to initiate conversations while Johnson was fighting in a promotion that treated him so well. Meanwhile, on the topic of heavyweight Alistair Overeem — who had been splitting time with the Blackzilians heading into his fight with Travis Browne last August — Robinson said the UFC hasn’t informed him that his next fight would be do-or-die. Overeem, who has lost consecutive fights, will face Frank Mir UFC 169 on Feb. 1 in Newark. Should he lose a third fight in a row, UFC president Dana White has made it pretty clear that might be it for Overeem’s tenure in the UFC. Robinson still manages Overeem, though he said the Dutch fighter is no longer a part of the Blackzilians team. “No, Alistair doesn’t train with us, he trains in Thailand,” Robinson said. “He’s welcome back, but he’s decided to do his camp in Thailand. It was a great camp. I talked to him last night, and it was a great camp and he said he feels fantastic. He’s in really good spirits. One fighter who has been around the gym on a regular basis is Vitor Belfort, who is slated to fight for the middleweight belt against Chris Weidman either in May or July. The hot topic when discussing Belfort, who has been on testosterone replacement therapy through his resurgence, is always whether or not his next fight will be in the United States. All three of Belfort’s 2013 fights occurred in Brazil. Robinson said that Belfort will fight anywhere the UFC asks him to, and that people should temper their presumptions about him and his motives. When asked if Belfort would apply for a therapeutic use exemption (TUE) if the fight happens in Las Vegas (as the UFC has said it might), Robinson said his gut feeling was no.